Blocking is a Facebook feature that allows you to ban people whose actions on your profile seems to intimate and most times annoying. You can always reverse this blocking actions on Facebook by unblocking people you might have blocked from seeing and interacting with your profile. 2. Next, click the small up-side down triangular shape icon at the top right of Facebook of any Facebook page and a drop-down menu will appear. 3. Now, you'll need to select Settings from the drop-down menu. 5. Scroll to the block section and type the name of the person you want to block in the space provided and then hit Block. Another way to ban people from accessing your profile on Facebook is to pass through their profile on Facebook. When you block someone on Facebook, the person's name saved in a separate folder on Facebook. The folder is known as blocked users. 3. On the new page that appears, choose How do I stop someone from bothering me? Alternatively, to view your blocked users on Facebook, follow step 1-4 on how to block people on Facebook above. Next, scroll down the page to the "blocked users section," and you'll see the list of the people you've blocked so far. To see all the people on that list, you'll need to scroll through it. To unblock a blocked friend on Facebook, under the "blocked users section" on how to view your blocked friends, click unblock next to the name of the person you wish to unblock. 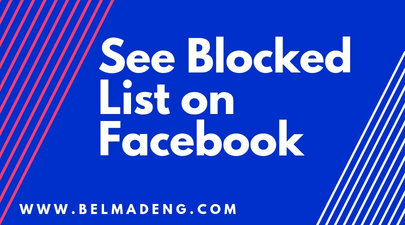 Please share "See Blocked List on Facebook" with your friends...Thank you!! Not helpful. Icons you say to click on are not on the FB line. It would also be helpful if you displayed the icon symbol you want us to use. 4. Scroll down to the blocked users section and you'll see the people you've blocked on Facebook. Sorry for not showing the FB icon. It always appears too big on this blog template.